??? ~ 1690: born in Kyôto, in the district of Miyakawa-chô. He is the son of Tanbaya Mokuemon. He starts his career at the age of 12 as a wakashugata playing under the name of Onoe Gentarô. 1690: Onoe Gentarô takes the name of Onoe Taganojô I. 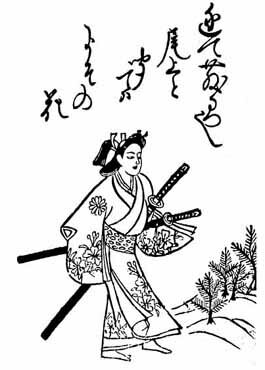 1693: Taganojô plays in Kyôto the role of Kamei no Rokurô in the drama "Shinjû Yashima". 11th lunar month of 1693: Taganojô plays the role of Shinnojô in the drama "Hako Denju", which is produced in Kyôto by Murayama Heiemon III. His stage partners are Mizuki Tatsunosuke I, Ichikawa Danjûrô I, Yamatoya Jinbê II, Tomizawa Samanosuke, Otowa Katsunojô and Uemura Takenojô. 9th lunar month of 1694: Taganojô plays in the same theater the role of Taira no Atsumori in the drama "Kumagai Nagori no Sakazuki". 2nd lunar month of 1697: Taganojô name appears for the last time as a Kyôto wakashugata. Onoe Taganojô I was the founder of the Onoe clan. He was a wakashugata and a wakaonnagata actor of the Genroku era. His forte was budôgoto. He was said to be a handsome actor endowed with a beautiful voice.